They play with Scala programs. They create drawings, animations, games, and Arduino based intelligent circuits (with appropriate additional hardware). Very importantly, they also learn how to learn with understanding – given the opportunity to apply learned ideas to many different situations, and the exploration, discovery, and creation involved in this process. All of this fosters in them a mindset of experimentation, innovation, self-reliance, growth, mental discipline, and teamwork – with Kojo as the enabler. Download the Explorations with Kojo ebook, and read pages 8, 9, and 14 to get familiar with the Kojo user-interface and workflow. Feel free to read more of the book for deeper learning and fun, of course. Work through the Getting started activity book (appropriate for ages 8 and older). Work through the Intro to programming activity book (appropriate for ages 10 and older). 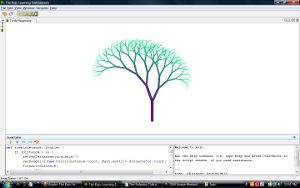 A productive, fun, and friendly graphical environment – where computer programming is used to explore and play with Math, Art, Music, Animations, and Games. 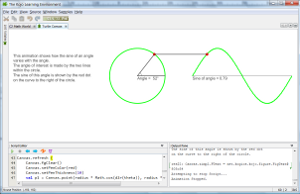 A point-and-click visual programming facility to make it easy to get started, with full support for text based programming for more advanced usage. Turtle graphics, for an intuitive beginning. Program Tracing to help understand how programs work. 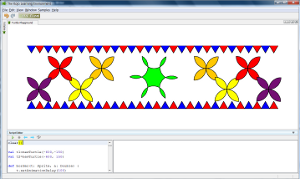 Pictures, which take turtle graphics to the next level, to create rich shapes that can be used in animations and games. Support for physical computing based on the Arduino and the Raspberry Pi - via the kojo-arduino project. Support for artificial intelligence and data science - via the kojo-ai project. Stories, to author creative works – using programs, text, images, sound, and music. Support for the composition and playing of computer generated music, and for MP3 music playback. 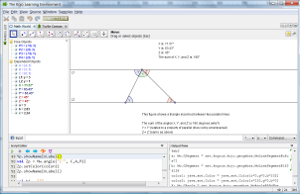 A virtual Math Lab (based on Geogebra) with good support for both Algebra and Geometry. An Arithmic Aerobics area that helps children practice and build up their math calculation skills. Powerful support (based on Stories) for authoring rich, interactive learning material. A modern, powerful, programming language called Scala to work with. You begin with a very small and simple subset of Scala, and progress to the level of Scala proficiency that you care to reach. Features like syntax highlighting, code completion, and code templates to make programming friendlier. Interactive Program Manipulation using the mouse and keyboard to facilitate exploration and discovery. Multi-language capability. English, Swedish, French, Polish, Dutch, Esperanto, German, Hindi, Russian, Italian, and Croatian are supported, with more to follow. 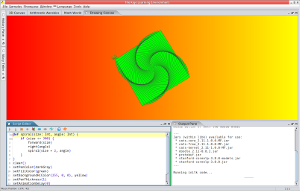 Kojo is open source software, and is available under the GNU General Public License.